with every Earlybird Order over $700. * Orders over $700 receive 1 candle. Offer limited to 1 candle per order. Exclusive offer for Earlybird orders received by 28 February 2018. Here’s a great use for your Glasshouse Candle – Consider holding a raffle. Everyone loves to win a prize!! Raffles or Barrel Draws are a wonderful way to create a real ‘buzz’ around your Mother’s Day Stall and also to raise a few extra dollars for your school. As a thank you for your business, we would like to help you to create a special ‘Mother’s Day Raffle’ by giving our Earlybird clients* a stunning 350g Glasshouse Candle. You may like to sell raffle tickets to win this beautiful candle at your stall for 50c – $1.00. You may like to be really creative and include the Glasshouse Candle within a larger ‘Pamper Hamper’ full of treats for Mum, including items like the Indulgence Bath Set, Bath Salts Cube and Hand Cream. 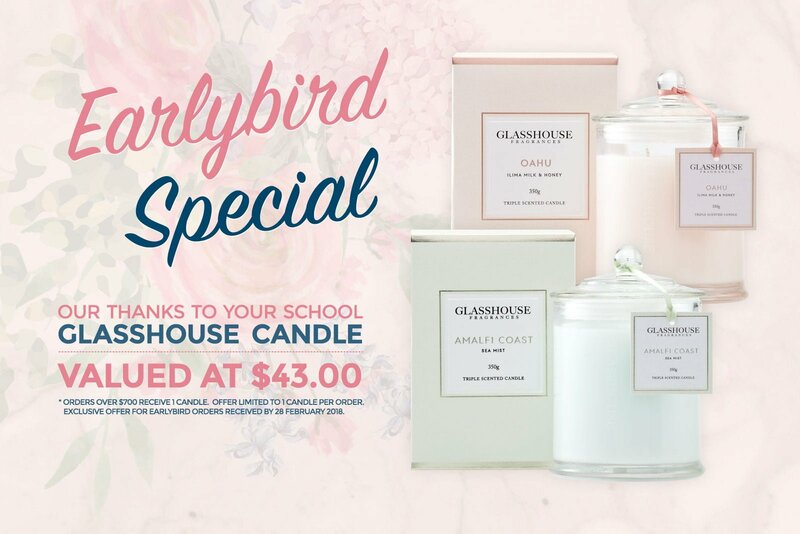 Or, your school may choose to give the Glasshouse Candle to a special Mum within your school community who would benefit from a ‘big hug’. Whatever you choose to do with this stunning candle, it’s our way of saying thank you. Here’s a few ideas to help you along. All the best and happy fundraising.